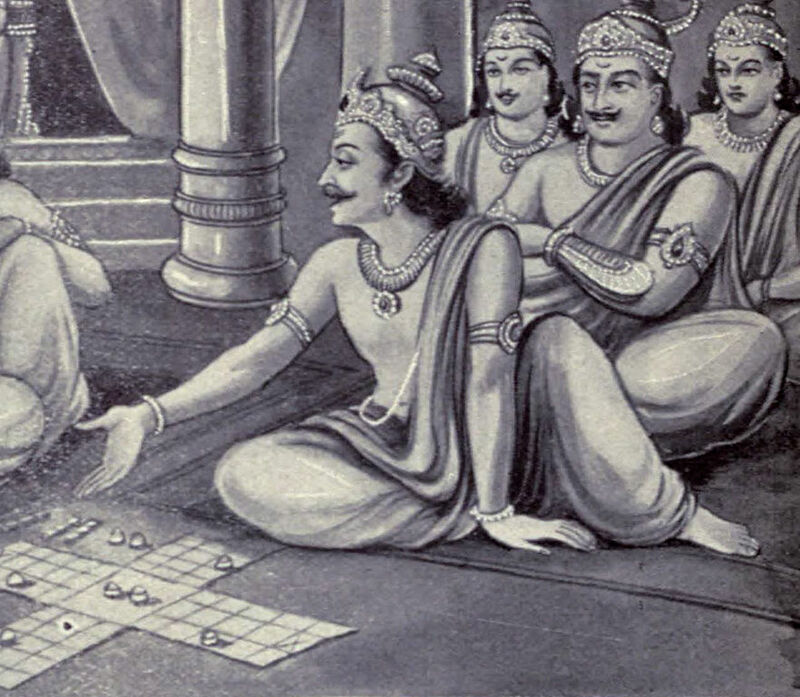 This story starts with the game which was playing between Kauravas and Pandavas. This game ends with a fight. Kauravas then abused Pandavas as "you are the children of a whore(women who work as a prostitute)" and then Pandavas abused Kauravas as "you are the children of widow(women whose husband was dead)". Kauravas were surprised after hearing that because their father Dhritarashtra is alive. They felt sad and did not know why Pandavas called them like that so they went to Bishma and told him everything. Bishma immediately called Subala(father of Gandhari) and asked him why Pandavas called Gandhari as a widow. Now real story started in the way like Subala is saying to Bishma, "When Gandhari was born, astrologers told him that her first husband will die but her second husband will live long". Subala continued by saying that to save Gandhari to become a widow, I married her to one goat and after the marriage that goat was dead. By hearing these words Bishma got angry because the father of a daughter has to tell everything to the family members to which his daughter has to go after marriage but Subala kept that as secret. Bhishma then thought Dhritarashtra marriage to Gandhari was a top plan that was made by Subala and his family. By thinking of this as an insult for Kaurava family, Bishma wanted to kill Subala and his all sons so that secret will die along with them. But killing one family was adharma, so Bishma tried one plan to kill them in a dharma way. He locked Subala and all his five sons Shakuni, Sauvala, Achala, Vrishaka and Vrihadvala in a dungeon(room or cell where prisoners are held). They are starving for food because Bishma offered them a small piece of food which is a one-time mouthful. So due to the starving for food they can die. This is Bishma plan to kill them. As the time was going, the situation became worst and they started to quarrel for that small amount of food among themselves. All became weak and fainted and they are ready to die. Then Subala came up with a plan and shared that plan with his five sons. He said to them like this, "Let one of us eat all the food they offer so he will be alive to take vengeance nothing but revenge on them". They all thought and came up with the conclusion that the youngest and intelligent son of Subala, who was none other than Sakhuni to eat all food and to be alive. Hence Sakhuni ate all the food they offer and he saw their family members died due to starving for food in front of his eyes. All remaining four sons died and now remained Subala and Shakuni. It was the time for Subala to die, on the day of his death Subala cracked the ankle of Shakuni's foot and he said like this, " Whenever you face difficulty to walk due to this broken ankle then remember the pain and the bad situation we have all faced before we died. Remember what Bishma did to your brothers and father and never forgive him. Take revenge on him and he continued to say like this "After I died don't burn my body and take my finger bones and turn them into dice. Those dice will be filled with my uncontrollable anger and those dice will turn in favor of you always and gives always whatever result you want and you will win always in the dice game. So use these dice to see the end of Bishma and Kaurava family." Then Subala died. After that Shakuni came alive and took his revenge with dice game and became the main reason for Kurukshetra war and end of Bishma and Kaurava family. Shakuni was the brother of Gandhari so he was an uncle for Kauravas. 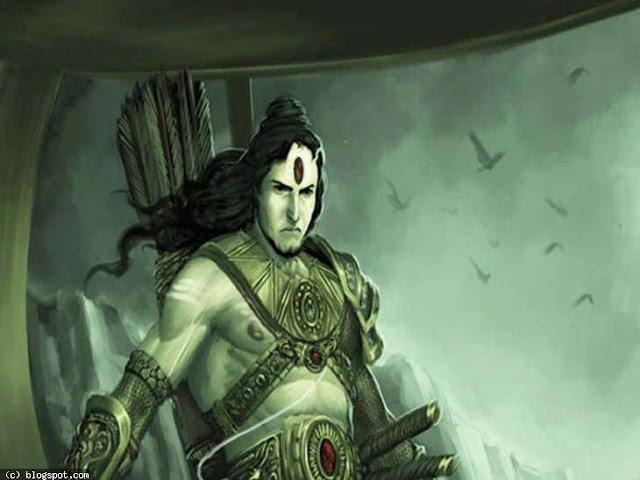 Even though Shakuni died in Kurukshetra war but he succeeded to take vengeance for his loving father and his brothers. This is the story of Shakuni in Mahabharat and his magic dice in Mahabaratham. If you like our articles share them from below share options or sidebar share options and make other people also increase their knowledge. Myself Mohan.Owner of this blog. Iam a software enginner. I will provide genuine stuff for all my readers.